Always good to see you, St. James. I’ll be back. As I loaded up my gear in O Pedrouzo I realized this would be my last day of walking the Camino de Santiago. The feeling was bittersweet — I was happy to know that I would accomplish the goal I’d set for myself months ago, but I was sad that the end of something I had enjoyed immensely was at hand. The weather was perfect. In fact it had been sunny without rain every day we’d been in Spain this August. We set out after a hotel breakfast anxious to put the miles behind us and get to the cathedral in Santiago and say hello to the Apostle James, after which the whole pilgrimage is named. 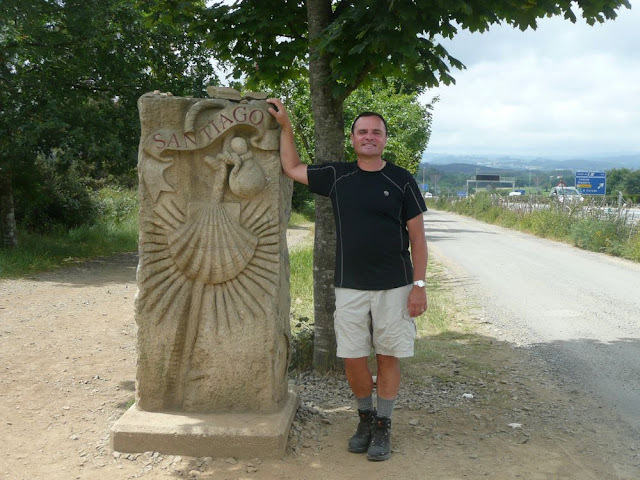 A few miles from O Pedrouzo are the outer fences of the Santiago airport, where the camino runs from the middle of one side, around the end, and then to the middle of the other side. This means about an hour of walking past the airport, sometimes with jets landing or taking off right overhead. At the end of the runway, near the road, is a stone marker that is the first welcome to Santiago. This is still some miles from the cathedral as we would discover. We continued on to the tiny village of Lavacolla, just below the airport, where medieval pilgrims had washed themselves in a creek as preparation for their entry to Santiago. We bought a soda at the sole bar and looked beyond us to a tall hill, perhaps our last before the city itself. The last hill seemed like a mountain range. We walked past a never-ending TV station property, through a subdivision of homes, and finally to the monument at Monte de Gozo — the Hill of Joy. From here is the first sight of the twin towers of the Santiago cathedral and, dominating the hill, is a modern sculpture that honors the visit of Pope John Paul II ten years earlier. We found our way to the enormous albergue below, then lost the camino from there, guessing that it must go to the bottom of the hill where the main road crosses a bridge into town. Sure enough, we picked up the trail again just before the bridge and noted with joy the sign indicating our arrival into the city limits of Santiago. At this point it seemed like we had already walked 30 km, not the 12 km we’d actually covered. This modern section of Santiago seemed just like any other sprawlingly suburban city approach. We walked past car dealerships, offices and strip malls, then came to the end of the street we were on, forcing us to make a left or right turn in order to continue. The path wasn’t clear, so we stopped once again for a cold drink and discussed our options, watching as we did to see where other pilgrims were heading. I could barely sit still out of excitement to complete the walk, and finally we began the last climb, up the hill and along the blocks of 6-7 story apartment buildings to what clearly was a gate into the old city. We walked through the gate, up the last hill past many tourist shops, down through a tunnel, turned left and came to the vast Plaza Obradoiro that sits below the cathedral’s grand west facade. We were here. For me, after 800 km and three months I’d made it to Santiago. For Gail it was 188 km of pain and struggle, perhaps over more difficult obstacles. It was afternoon now, and we had missed the noon pilgrim mass so there was no point in rushing to get to the cathedral. Instead we headed to our hotel, The Altaïr, and immediately fell in love with its combination of old world warmth and modern sophistication. Gail settled in for a well-deserved rest and I headed out for my pilgrim certificate and to explore this town that I’d been aiming for all these months.